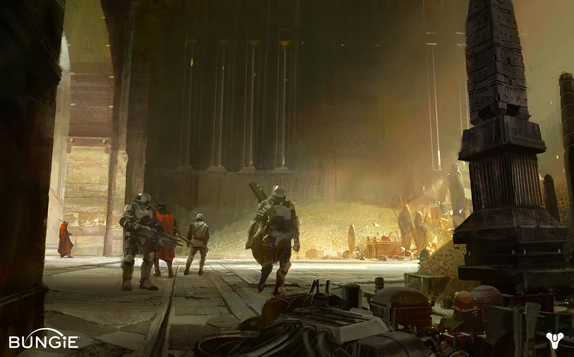 This week at Bungie, we’re traveling to a future where you’ll have more space for all your off-worldly treasures. ・Vault Space – We know you need more space to collect all the treasures you gain from your missions, and more gear is on the way. It’s time to let the door swing wide and share some more details. So, let’s go. Ever since the first Guardian acquired more gear than they could carry on their character, the Vault has been the go to venue for safe keeping. That first act of stowing sweet loot might have led that Guardian to dream of all the riches to come. Would they ever fill the empty space with weapons and armor befitting a certified legend? Today, the dimensions of your Vault provides for the storage of twenty (20) ARMOR pieces, twenty (20) WEAPONS, and twenty (20) GENERAL items – you know, things like materials, shaders, emblems, ships, vehicles, etc. While our progenitor Guardian above dreamed of things to come, you, should you fancy yourself a veteran collector in Destiny, have another more pressing and practical question: where am I going to store all of my stuff?! Update 1.1.2 will push the boundaries of your secure repository. The new dimensions will let you store twenty-four (24) ARMOR pieces, thirty-six (36) WEAPONS, and twenty-four (24) GENERAL items. If you’re a visual learner, here’s a look at how those numbers manifest into more room to grow. You might be surprised to learn that not all of us have such a vast array of riches. John Hopson is the User Research Lead at Bungie who can peer into every Vault in the Tower. According to his analysis, the majority of us still have room to spare. JH: Very few people have completely full Vaults, but a lot of endgame players are bumping up against the limits. 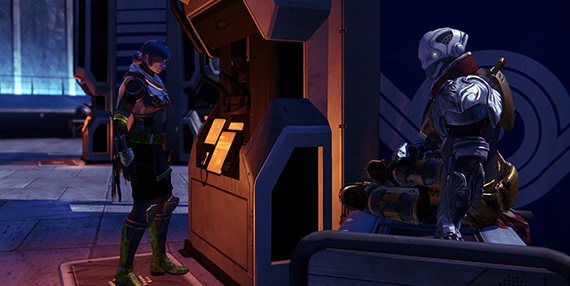 For example, 21% of players who are level 30+ have 4 or fewer free spaces in their weapon Vaults right now. The armor and general sections are slightly less full for most people, but not by much. Even at lower levels, there’s a small but measurable fraction of players under level 20 who have full Vaults. You could charitably think of them as “collectors” or uncharitably label them as “packrats,” but some people just flat out like holding onto their stuff. Personally, I’m still waiting for the Pocket Infinity bounty so I can use up the 10 rare fusion rifles I have saved. It has to drop sooner or later. Those of you who have put in the time and effort to amass a might cache of loot have told us that you need more space. M.E. Chung has heard you, and as the Live Team Lead, she’s uniquely able to respond. M.E. : For many, many weeks, Vault space has been an important request in the queue that we’ve been tracking. As we get closer to the House of Wolves content update, we knew we had to expand the Vault or the community would not have enough space to store the new Exotics we’re making! Different players have different needs, but our goal was to find a solution that could deliver more Vault space to the greatest number of people in the short term. Our challenge was to provide an increase in storage that fit within the memory constraints that limit how many items can be displayed on one screen. This had to be accomplished by a team who is simultaneously working on future content. We opted for making sure that players would have enough slots for all Exotics from Launch through House of Wolves - thus the largest increase in slot space is for weapons. We know there are a bunch of players in the world who don’t have enough space for Armor and General items. We’ll have a solution for you in the future. This fix might seem simple. At Bungie, we love to make the development of games look easy. UI Engineering Lead Brad Fish can lend some context to the fact that it was no simple undertaking to add some shelf space to your keep. BF: Like a time traveler whose actions in the past inadvertently alter the course of history in unexpected ways, each modification to Destiny has the potential to introduce a variety of side effects. Planning and meticulous verification are key to ensuring the continued stability of the game. In the case of the Vault expansion, it became clear that we would be pushing very limited memory constraints on older generation hardware. We had a choice: leave the Vault as-is, or find some kind of compromise to enable it safely. We weighed the options, with player feedback in mind, and decided to move forward with the expansion by disabling the item comparison feature within the Vault on PlayStation 3 and Xbox 360. Item comparison will continue to function within the Vault on PlayStation 4 and Xbox One, and in all other contexts on all platforms. We may not be making you as rich as Charlemagne, but those of you who have Vaults that are bursting at the seams with sweet loot are in for some relief. Stand by, because Update 1.1.2 arrives in April. As for what the future holds for Vaults, only a time traveler would know for sure. A Senior Artist by the name of David Helsby was talking to me about uploading some of the presentation materials from his recent GDC talk about First Person Animation. I told him it sounded like a great idea, but only if he agreed to share some of his insights with people who didn’t have the chance to attend the lecture. Here he is to tell us a little about why our Guardians always know what to do with their hands in Destiny. DH: First Person Animation is the motion of your avatar that you see through the eyes of your Guardian. This includes the ways your arms and hands deliver attacks or handle your weapons, how the weapons themselves behave when they’re being used, and even the movement of the camera in shaping your point of view. It’s the punching, throwing, shooting, reloading, or that moment when you twirl your Exotic hand cannon around the trigger guard before taking aim. DH: It was really great to talk about all the things that I’ve learned from the great people here at Bungie. It’s been a pleasure to work with Sage Merrill, Josh Hamrick, and the whole Sandbox Team that created the gameplay that we illustrated with animations. Rick Lico (the principal animator here at Bungie) taught me a lot about how camera animations can be used to enhance the gameplay experience while not making you motion sick. We all worked hard together to create the combat experience you’ve come to know as your own. I had fun learning more about how they think about our avatars. Hope you did as well. Think about that the next time your weapon-wielding gauntlets are the first thing through the door. Once again, the Player Support team is reaching out from the Operations Center with news you can use to be a healthy citizen of the community. They’re here to tell you about how the Bungie.net team has been “sunsetting” social network logins, along with issues that might get in the way of your game. The 2.50 Firmware update for the PlayStation 4 will implement a Suspend and Resume function on 3/26. This function will not work with Destiny at this time. Functionality for the Suspend and Resume feature will be enabled for the 1.1.2 Update. Read more about this feature here . On March 24th, Facebook and Google+ logins for Bungie.net profiles were permanently disabled. If you had an account with these authentication methods and did not link a PSN ID or Xbox gamer tag, you can no longer access or recover this account. If you find yourself in this scenario and want to get back onto the Bungie.net forums, you will need to create a new account. To learn about account creation and linking, please read our FAQ . Lastly, we have noticed some players are hitting an error that states “Your permissions to access online multiplayer may have changed or your profile may have been signed in elsewhere.” We have a help article that can clarify what may have triggered this error. An important step to consider if you encounter this permissions error on the PlayStation 4 is to confirm your network connection. If you have switched your connection from wired to wireless (or vice versa), it will attempt to use your previous connection settings until you re-run the system’s network setup. You can access your PS4 network settings by navigating to Settings > Network > Set up Internet Connection. They’re always thinking about what you need to play. If you need to get their attention, the Help forum is a great place to start.